Classical Artist Zhi Yu, was born in Chang shu, Jiangsu province in the 18th century. He was a Court Painter and also worked for the Qianlong Emperor as a government servant. His drawing is in an academic style and is inspired by nature including flowers and birds, fishes and insects, which are painted vividly with fine lines and graceful movements. 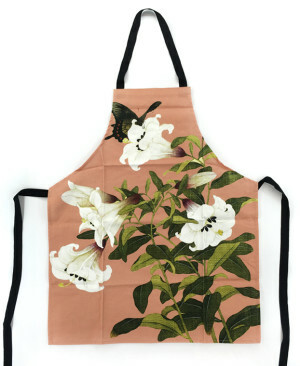 This apron has a design inspired by the work of Artist Yu featuring a butterfly resting on a bright flower. It makes an elegant gift base on the classical Chinese master piece. New & exclusive to JE gallery, bring you the best of oriental art & culture. Classical Artist ZhiYu, was born in Changshu, Jiangsu province in the 18th century. He was a dedicated Court Painter and worked for the Qianlong Emperor as a government servant. His drawing is in an academic style and is inspired by nature including flowers and birds, fishes and insects, which are painted vividly with fine lines and graceful movements. 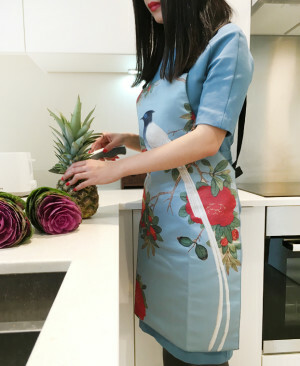 This Apron has a design inspired by the work of Artist Yu featuring a long tailed bird resting on a camellia flower. It makes an elegant gift and a tasteful and romantic addition to the kitchen. New & exclusive to JE gallery, bring you the best of oriental art & culture. 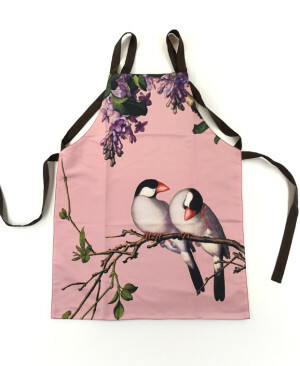 This Aprons is inspired from classic ornament which is amongst the most beautiful illustration ever made. The artworks is striking not only for the its fine detail and the technical skill shown in its production, but also for its exquisite colouring and ornamentation. A great gift for art and culture lovers alike. 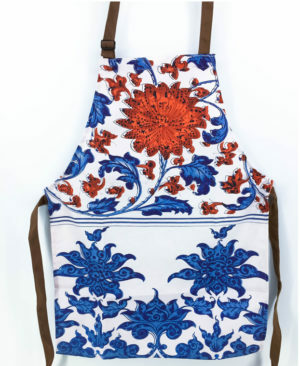 This Aprons is inspired from classic ornament which is amongst the most beautiful illustration ever made. The artworks is striking not only for the its fine detail and the technical skill shown in its production, but also for its exquisite colouring and ornamentation. 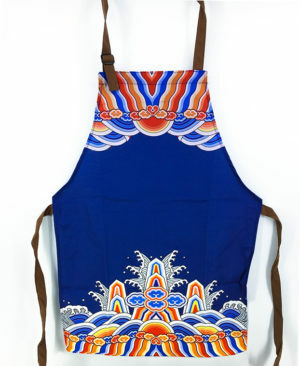 This apron has a design inspired by the work of Artist Zhang Xuan (713-755). It depicts three groups of ladies pounding, sewing and ironing silk. Two young maids assist the ladies by keeping the charcoal hot and the silk stretched whilst a little girl plays on her own. It is one of Zhang Xuan’s most well-know works and it would make an elegant gift and very tasteful and romantic addition to the kitchen. New & exclusive to JE gallery, bring you the best of oriental art & culture. 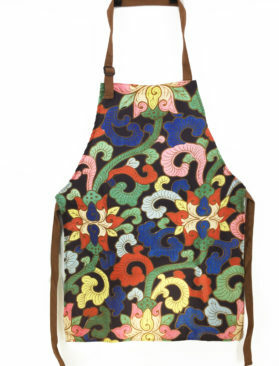 This Aprons has a design inspired by Emperor’s gowns which loaded with artful ornaments and hidden symbolism for good luck. The image features the cosmic sky is enclosed at the bottom of the garment by a sea of waves punctuated by geometric shapes that are evocative of mountain peaks (isles of immortals) and clouds. 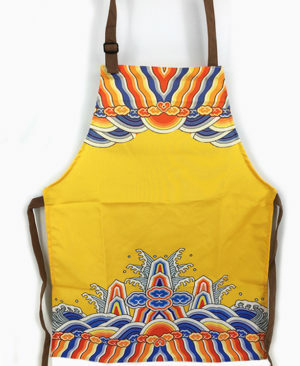 This apron is inspired from an ukiyo-e woodblock print by Japanese artist Utagawa Kuniyoshi (1798–1861). 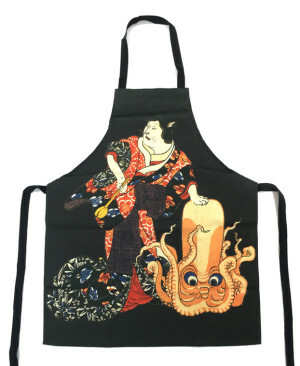 Kuniyoshi was known for his depictions of historical and mythical scenes, the apron featuring a cat impersonating a female kabuki character has struck an octopus on the head with a wooden scoop. It would make a funky gift and fun addition to the kitchen. Katsushika Hokusai (1760-1849) was the leading ukiyo-e artist and printmaker of the later Edo period. He was also Japan’s foremost expert on Chinese painting. 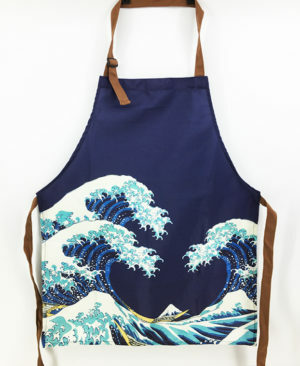 This apron has a design inspired by Hokusai’s iconic woodblock print the ‘Great Wave off Kanagawa’ which shows the mountain from the sea on the coast to the south-west of Tokyo. 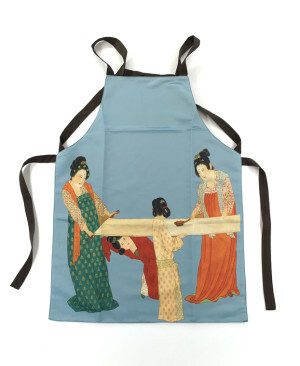 This Apron would be a perfect gift and very tasteful addition to the kitchen. Katsushika Hokusai (1760-1849) was the leading ukiyo-e artist and printmaker of the later Edo period. He was also Japan’s foremost expert on Chinese painting. This T-shirt has a design inspired by Hokusai’s iconic woodblock print the ‘Great Wave off Kanagawa’ which shows the mountain from the sea on the coast to the south-west of Tokyo. 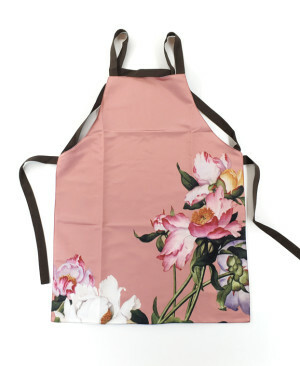 This Apron would be a perfect gift and complement your new season look in style. This amazing print is available in a T-shirt too. New & exclusive to JE gallery, bring you the best of oriental art & culture. This apron has a design inspired by the work of Artist Lang’s ‘Immortal Blossoms of an Eternal Spring’ series of ink paintings. The particular piece features Chinese herbaceous peony flowers which was painted in Chinese style but incorporating Western techniques of shading and atmospheric perspective, imparting a sense of realism to the native themes. It makes a unique gift and exquisite delight to the kitchen. New & exclusive to JE gallery, bring you the best of oriental art & culture. This apron has a design inspired by the work of Artist Lang’s ‘Immortal Blossoms of an Eternal Spring’ series of ink paintings. The particular piece has purple and white cloves and features of Java Sparrows resting on purple & white cloves. The painting was done with Chinese style but incorporate Western techniques of shading and atmospheric perspective. It makes a rare art gift which fusing Chinese and Western culture and exquisite addition to the kitchen.